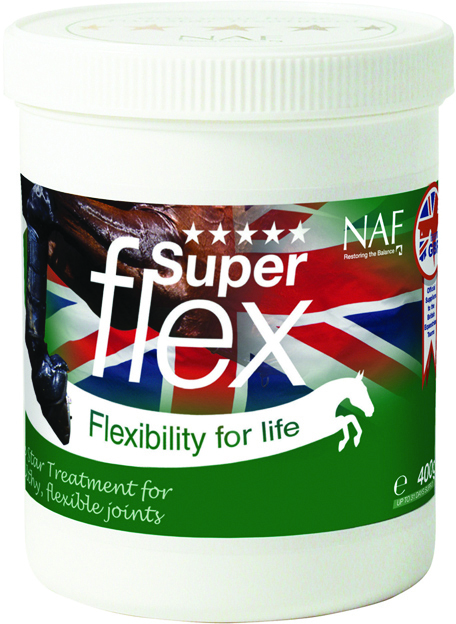 NAF Superflex contains the key ingredients necessary to support joint health, comfort & function: Glucosamine; Chrondroitin; MSM; Hyaluronic Acid (HA). It also benefits from powerful anti-oxidants, which help against damaging free radicals around joints. NAF Five Star Superflex is designed to help with damaged cartilage; cartilage is an important part of the joint & a common cause of pain when damaged due to wear & tear. Superflex also aims to improve the quality of joint fluid, which lubricates joints. Superflex is available in both powder & liquid form. Feeding Instructions- Give a higher loading rate initially, then lower to a maintenance rate. The maintenance rate can be adjusted to suit your individual horse/pony & isn't necessarily related to bodyweight.